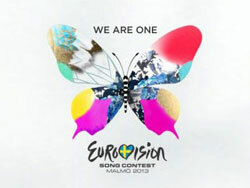 Eurovision – WE ARE ONE! The party is over for another year. We enjoy watching and listening to everything that involves different countries and languages so we are naturally all big Eurovision fans here at Apple Languages! Here are some thoughts I’d personally like to share about this event. Each year I like to hold a Eurovision party where all guests represent one of the participating countries, dress up in a traditional outfit or flag and bring a typical dish from that country! Since watching the semi-finals, I thought Greece’s act was brilliant and one of the only songs that really captured my imagination of what the ‘party-mood’ should be like, so I decided to represent that country. Other guests at the party represented Italy, Sweden, Germany, Spain and England, so you can imagine that we had loads of delicious dishes! I just came back from my fourth trip to Stockholm and already I can’t wait for my fifth! Stockholm is a lovely place to be at any time of the year and its location at the coast and the warm Gulf Stream make it warmer than you might expect from a Scandinavian city. This year I went in early May when the weather had just taken a change and all the trees and flowers just started blooming. It was really a great atmosphere in the city with all the Swedish people taking pictures of the blooming cherry trees and waiting in long queues to get some ice cream at lunch break! 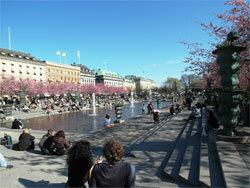 A must during any stay in Stockholm is a walk through the old town which is called Gamla stan in Swedish. This part of the city, like all of them actually, is located on an island and connected to other parts of the city via bridges, subways and ferries. Gamla stan is home to the Swedish Parliament House, Royal Palace and Stockholm Cathedral, among others. The medieval architecture and cobbled streets found here are, in addition to its unique waterfront location, one of the reasons why Sweden’s capital is famed for its beauty.